Ellyn Ruthstrom and Kevin Hogan represented the Bisexual Resource Center at the 1st Roundtable on Bisexual Issues at the White House. The domino effect metaphor is often used in a negative way, such as “if Vietnam falls to the Communists, then all the surrounding countries will become Communist.” (Didn’t happen, btw.) However, when I think of those intricate domino patterns that enthusiasts set up and then set into motion, I think the domino effect can have a positive spin to it as well. And that, oddly enough, brings me to the Bisexual Health Awareness Month (BHAM). As BHAM achieves its fifth anniversary, it’s a good opportunity to look back at the energy within the community that brought about this important development. The Bisexual Resource Center brought BHAM into existence in 2014, but the bi+ community has been growing and nurturing itself for over 30 years. Despite the stigma, the outright biphobia, and the more subtle bi erasure, bi+ activists have been laying the groundwork for this national social media campaign since the 1980s. I won’t attempt to make this a history lesson about bi+ activism because we have a rich and storied past that is too long and involved to be encapsulated here, but I do want younger community members to know that they are continuing the work of committed activists who have been working both within the LGBTQ movement and within our own bi+-specific organized spaces for decades. The Bisexual Resource Center was established in 1985, originally as the East Coast Bisexual Network (ECBN), and BiNet USA followed in 1990. So when May 16th comes around this year, know that there are plenty of bi+ elders to highlight on Honor Our LGBT Elders Day. 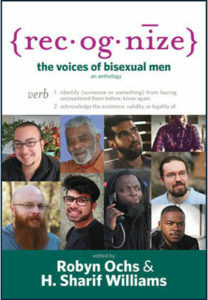 The Bisexual Leadership Roundtable convened for the first time at the Creating Change in Atlanta, GA in January 2013 including representatives of the Bisexual Resource Center, BiNet USA, Bisexual Organizing Project, and the American Institute of Bisexuality. Fast forward through a couple of decades of community building and pushing for visibility and recognition within the larger LGBTQ movement and we come to 2012. 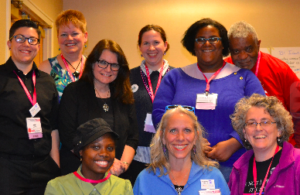 The idea of a networking mechanism for bi activists had been bouncing around for a few years, and, finally, representatives of the national and regional organizations got together for the first Bisexual Leadership Roundtable at the 2012 Creating Change Conference in Baltimore. The group convened several times in person and by conference call and eventually met with President Obama’s liaison to the community, Gautam Raghavan, at the following Creating Change conference in 2013. Later that year, to mark Celebrate Bisexuality Day in September, the first Bisexual Roundtable on Bisexual Issues took place with 33 bi+ activists presenting to a packed room of LGBTQ organizations and Obama Administration officials in the Eisenhower Building of the White House. Co-organized by the Bisexual Resource Center and BiNet USA, individual teams shared bi-specific information about workplace harassment and discrimination, intimate partner violence, the extreme physical and mental health disparities within our community, hate crimes against bisexual people, and the need for more bi inclusion within HIV/AIDS research. Each team provided policy suggestions to the Administration to address the issues they raised. In September 2013, 33 bi+ activists from across the country gathered at the LGBTQ Task Force offices before leaving for the first Roundtable on Bisexual Issues at the White House. Returning to Boston after this historic meeting at the White House, the BRC board started talking about ways to continue drawing attention to the issues discussed in Washington. Fortuitously, Julia Canfield was interning with us as part of her master’s degree work at Boston University in the School of Public Health. 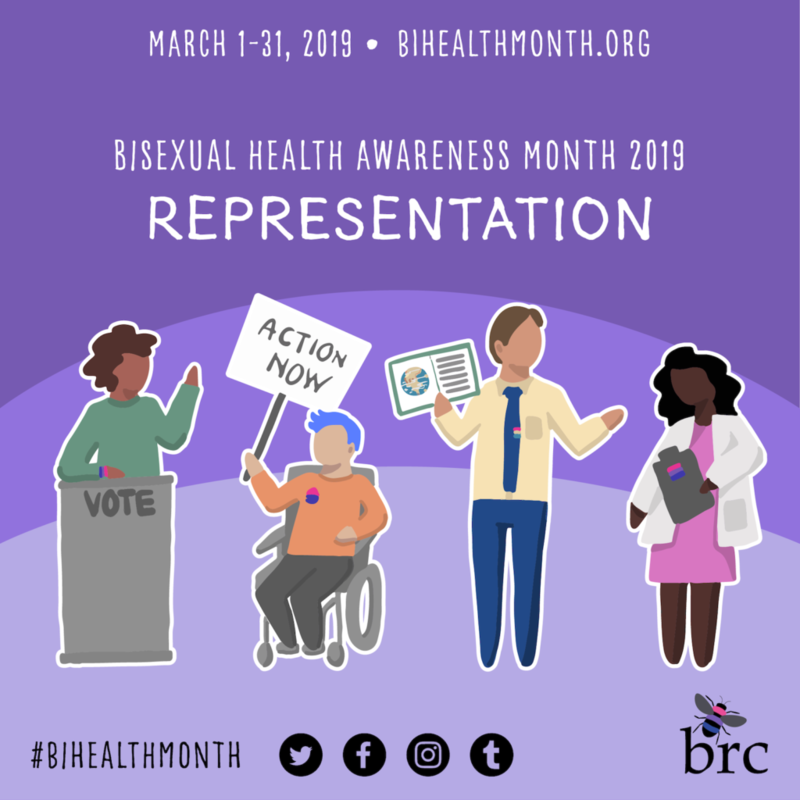 She stepped forward with the idea of a Bisexual Health Awareness Month social media campaign where we could highlight the physical and mental health disparities that we now knew were deeply affecting our community. And in just a few months, we pulled together the first BHAM in March 2014! 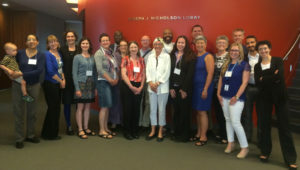 In June 2014, the Fenway Institute hosted a gathering of bi researchers and activists that helped to found the Bisexual Research Collaborative for Health (BiRCH). 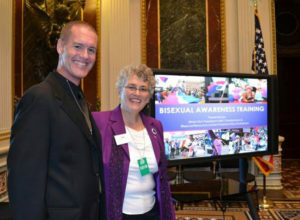 Also, fortuitously, the wonderful Dr. Judy Bradford of the Fenway Institute was at the White House meeting and the health disparity information that was presented instigated her to seek to highlight the health concerns of the bisexual community more. In early 2014, Dr. Bradford reached out to me and described her idea to convene bi health researchers and community activists at Fenway Health to seek more opportunities for research and collaboration to shine the light on the bi community’s serious health concerns. That idea resulted in a June 2014 meeting in Boston where the Bisexual Research Collaborative for Health (BiRCH) was born. And though we sadly lost Dr. Bradford last year, BiRCH continues to pull bi health researchers together and support more research in the field with the leadership of Dr. Brian Dodge and Dr. Wendy Bostwick. And in September 2014, BiNet USA took the annual Celebrate Bisexuality Day and expanded it into Bisexual Awareness Week, which offers a wonderful opportunity to celebrate our multifaceted community in a much deeper way. Bi+ communities around the world present varied cultural programs, discussions, visibility actions, awards nights, and some damn good parties to honor our beautiful selves. One domino leading to another. The valuable campaigns and organizations we now have are the result of a synergy of many different individuals and initiatives that have worked extremely hard over decades to build greater awareness of the bi+ community. The enhanced connections between the activists and organizations over time has allowed our community to do more and to reach a much larger audience by working together. What is most inspiring to me to see over the course of five years of BHAM is the U.S.-based and international bi+ organizations, LGBTQ organizations, and health-focused entities that have taken it upon themselves to promote the information and resources from the BHAM campaigns and often to create their own. Some organizations sponsor discussion groups, bi visibility events, art exhibits, publications, and other creative ways of disseminating the various messages from the campaign. BHAM takes a boatload of work each year to shape the theme, research the topics, draft the posts, design graphics, work with writers, publicize the calendar, connect with partners to encourage participation, and more. A huge thanks to all who put time and energy into the fifth year of raising awareness about bi+ health issues, especially Laura DelloStritto, who has been managing the campaign for the last two years. Next Post Performing Bisexuality: Am I Performing for Male Attention?